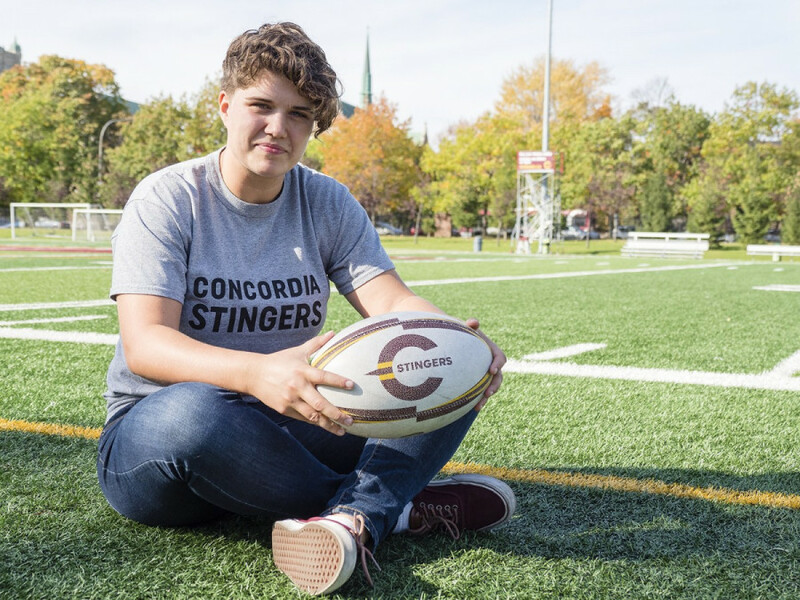 Gabriella Dobias has always fancied herself an athlete, so it’s no wonder her transition from Concordia’s women’s soccer to its rugby team has been so smooth. “I’ve always been a lover of all sports. I played basketball in high school, played everything that I could,” said the fifth-year exercise science student. For the last four years Dobias called herself a member of Concordia’s Stingers soccer team. “[Dobias] joined the team for the 2012 season, as basically a walk-on who contacted me that summer to tell me she was coming to Concordia,” said her former coach, Jorge Sanchez. After four seasons of Concordia soccer, being held back by an injury and some issues with her academic progress, Dobias decided it was time for a change. Dobias took matters into her own hands and sought out women’s rugby head coach, Graeme McGravie. “She first came to me about playing in April and I told her to join a club in the summer to decide if she really liked it or not,” said McGravie, who’s known Dobias since her first year at Concordia. McGravie was her academic advisor when he worked for admissions, and he felt from the first time he met her that she was the kind of athlete he’d like to have on his team. “She’s always been one of those people where I felt that if she wanted to try rugby and play soccer I would try to make it happen,” he said. This summer Dobias—who plays as a back, the position generally asked to move the ball—joined the local rugby club, Montreal Barbarians, where she got her first taste of the rugby pitch. For the past seven years and throughout university, many have encouraged her to play rugby, said Dobias. In the eleventh grade, her best friend’s father started a rugby team out of her high school but she decided not to play. “My mother really didn’t want that for me because of my face and the possibility of breaking my teeth,” she said. So, she remained on the sidelines supporting her friends. After playing all summer though, Dobias finally decided to make the switch, leaving the team she’s been a part of her whole university career, to become a member of Concordia’s rugby squad. Overall, her friends and family have been supportive of her decision, or at least mostly supportive, in the case of her mother. While rugby is not entirely similar to soccer, it’s safe to say that her previous experience on the soccer field has been helpful to her game. McGravie believes that a lot of her basic skills, like quick feet, body positioning, and aggression, transferred easily. Another important skill Dobias brought over with her is her kick. Having been trained to kick a soccer ball with precision, it’s natural for her to use this to her advantage on the rugby pitch when kicking for conversion after a try. She has an eye for angles and she sees exactly where she needs to put the ball, kicking it between the uprights with ease. Skills she did not bring with her from soccer, she’s picked up fairly quickly with a little bit of hard work. Dobias attributes some of her success to her summer with the Barbarians, which gave her valuable experience she was able to bring with her to Concordia. Used to being a Concordia athlete, Dobias already knew the level of professionalism that was expected, she explained. Also helpful was her experience with open play in soccer, which translates well to rugby especially as a back which requires players to really see the field. That is not to say there were no challenges for her in this experience. “Hitting was something to get used to for sure,” said Dobias. Even with the advantage of having spent years watching rugby games while cheering on her friends, Dobias felt it was difficult to catch on to the specifics of the game. Rugby is inherently complicated to learn given the complexity of the rules and the plays, so it makes sense that she would struggle in this aspect. “With the backs there are a lot of plays, and sometimes they would explain things with certain terminology that I just did not understand, which really put me on my heels sometimes,” said Dobias. Despite these minor setbacks, Dobias feels she had a successful season—she’s learned quite a bit, she said. She intends to apply the knowledge she’s learned as a rugby player at Concordia again this summer with the Barbarians in hopes she improves even more. Ultimately, Dobias is successful in her transition from a technical viewpoint. But on a more personal level, she feels she’s really bonded with the team. A rugby team has a special kind of dynamic that is unmatched by any other team sport, where teammates sweat, cry, bleed, and drink together. She credits this to the fact that a lot more of her rugby teammates live in the same area whereas in soccer, they were more spread out. Having a lot of her teammates from the Barbarians also play for the Stingers really enhanced the experience in her opinion, since Dobias never really got that experience with the soccer team given that each player played for a separate club during the off season.